Before each homeschooling year, I make a curriculum list for the coming year. With 10 children, I am a frugal homeschooling mom who tries to stretch my dollars when it comes to buying curriculum. Over the years, I have been stocking my bookshelves with books and curriculum that passes down from one child to the next. For example, we use Rod and Staff and Saxon Math. I have been watching ebay auctions and buying used books and sets and even some new sets for a fraction of the price of a new set off another website or at a curriculum fair. The end of the school year and into summer is a good time to find preowned curriculum on ebay. I watch auctions I am interested in and also check out the completed auctions to see what items have sold for. I search completed auctions by newly ended, highest or lowest. This gives me an idea of what auctions are ending at. I recently found the Veritas Press combination phonics kit for kindergarten and first grade which is in the catalog for over $200. I won a set that was in excellent preowned condition for a total of $60. I also found Saxon Algebra 1 complete set for a total of $20 and an Apologia highschool science set for $15, which is regularly in the $60 to $70 price range probably because the seller didn’t put “Apologia” in the title. 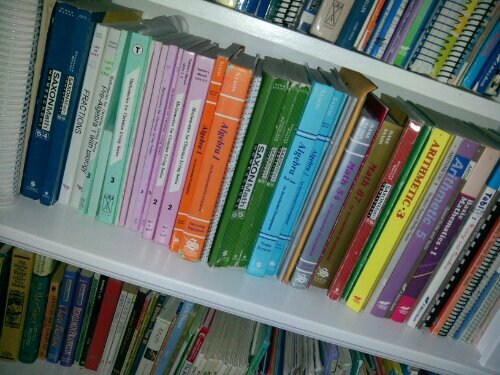 I have also found various grammar workbooks for a few dollars each. Be careful not to get caught up in the bidding. I always check the brand new price of the curriculum I am looking at first. I also check Amazon and Christian Book Distributors as I find deals on curriculum through those sources as well. Also, be sure to read ebay descriptions thoroughly. Sometimes it is cheaper to buy sets brand new rather than piecing them together. Most of the time, ebay is cheaper on teacher’s manuals and you can buy the brand new work book to save money. Sometimes it is cheaper to buy the brand new book off ebay even if it is the same price as in the curriculum catalog because many times the seller offers free shipping and the catalog website charges shipping. Any other purchasing curriculum ideas or tips?? ← What’s Growing In The Garden? Don’t know if you remember me, but I used to visit your blog a lot years ago. My time for reading blogs has diminished quite a bit, but I had been thinking about you…wondering what you all have been up to…and thought I’d swing by and catch up. I see you have 10 children now! We have 10 too! 🙂 Our youngest is 8 months old. Congratulations on your new sweet one! In addition to Ebay, I buy from book swaps and homeschooling boards/groups. Yes…my time for blogging is greatly limited now! There is always so much to do with having such a full house! Hopefully, I can keep up random updates. We always like to look back over the blog to see what happened each year…..so it is an incentive to journal the happenings on the farm. I have found lots of great deals on homeschoolclassifieds.com. It is also a good place to sell any books you no longer want or need.